I love Valentine’s day. I love running. So why not put those two together for a 5k?! Running Valentine’s day 5ks in my opinion are the most fun. Reason #1 these are usually fun runs that you can do with your friends (or significant other *wink wink*). Reason #2 there are so many costume ideas and running v-day puns to choose from. Stuck on costume ideas? 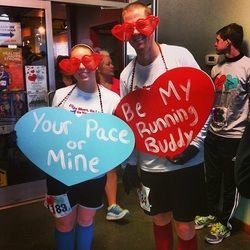 Or even just need some puns to put on your running buddy’s valentine? Well read below and feast your eyes on some ideas that will surely knock your compression socks off. Simple t-shirt heart: Cut out a large heart from felt that will fit on the back of a t-shirt. Glue onto the t-shirt using a hot glue gun and write one of the puns below on it using a Sharpie. This is an easy costume that doesn’t require a lot of crafting skills. Will you PRE my Valentine? Even if you aren’t crafty, fun socks and red/pink running wear will be sure to please! We want to see your costumes! Tag us on Instagram with your vday costumes for a chance to be featured!